Youth Transplant Kamp is a specialized camp for children ages 8-17 who have undergone heart, liver, lung, or kidney transplants. This camp helps to create a support network and a community of friendship among children who have had similar life experiences with organ transplantation and have experienced feelings of being socially isolated from their peers because of their medical challenges. 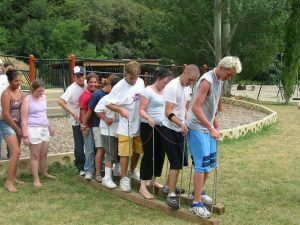 The goal of the camp is to help young transplant recipients gain greater independence, confidence, and self-esteem through their participation in outdoor adventures and experiences such as horseback riding, hiking, swimming and ropes course. Donations of used cars to the National Kidney Foundation of Utah & Idaho have made possible the creation of the Care-A-Van – a volunteer-based program designed to help dialysis patients get to and from life-saving treatment sessions. 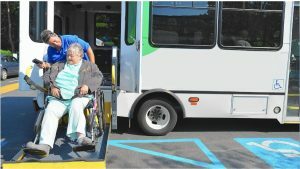 “These patients don’t have a choice, dialysis is the only means of having some quality of life as well as quantity,” said Patsy Hough-DeCaro, a Care-A-Van representative. Each year The National Kidney Foundation of Utah & Idaho, in conjunction with the Great Salt Lake Truck Show, sponsors the Truck Show Family Kidney Kamp. 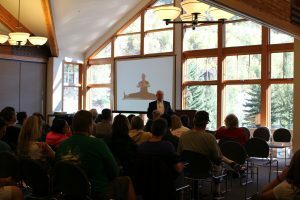 Dialysis and transplant patients and family members annually spend the first weekend of September among the pines at Aspen Grove at the base of spectacular Mount Timpanogos. 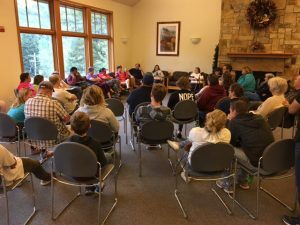 Hospitals are forgotten as campers participate in fishing, swimming, hiking, basketball, shuffle board, miniature golf, racquetball, arts and crafts and motivational learning sessions. Motivational speakers inspire atte ndees with real life stories of facing challenges, overcoming adversity and dealing with challenges. 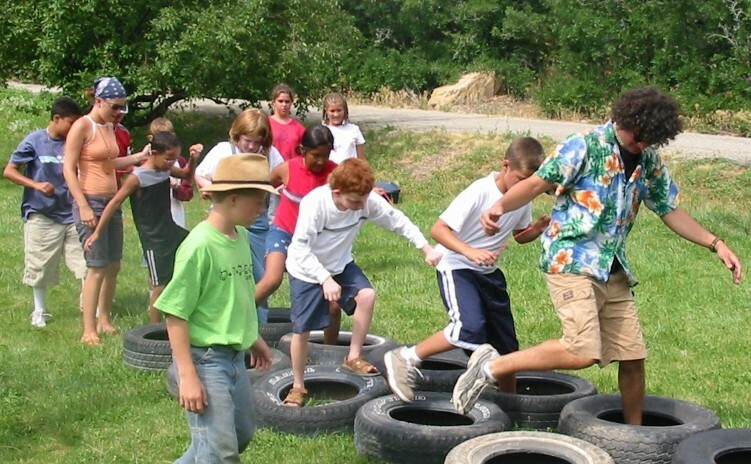 Saturday afternoon “Follies” offer the chance for families and new found friends to bond together in fun and challenging outdoor contests. 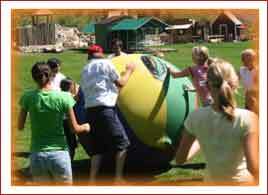 The spirit of fun, camaraderie and family unity lifts the hearts of patients and their families. Lasting friendships are formed and lifelong memories are made. Patients and families leave the camp emotionally, physically, and spiritually renewed and better able to cope as a family with the challenge of living day-to-day with kidney disease. The NKF of Utah & Idaho Educational Scholarship Program is dedicated to enhancing the independence and self-sufficiency of Utah and Idaho kidney patients. These scholarships are awarded to kidney transplant recipients and dialysis patients to assist them in the completion of their higher education. 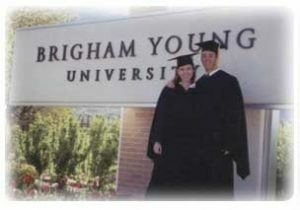 Students range from freshman to seniors, and pursue degrees at colleges in Utah, Wyoming, and Idaho. The Foundation is grateful to the George S. and Dolores Dore Eccles Foundation for their generous grant which helps to make these scholarships possible. The National Kidney Foundation of Utah & Idaho provides help for kidney patients through its Patient Emergency Services program. Patients in need receive assistance grants to help pay for food, rent, utilities, transportation, vehicle maintenance, medical insurance, medications and doctors bills. The Foundation also supplies each Dialysis Center throughout the states of Utah & Idaho an Emergency Patient Fund to assist with emergency needs. “It means so much to me to have a place where I can go for help when things get tough. 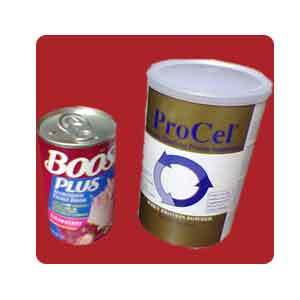 You are truly wonderful people.” – Sandra W.
The Nutritional Supplement Program provides dialysis patients with nutritional supplements such as Boost Plus and Pro-Cell. As a result of this program, dietitians at Utah and Idaho dialysis centers have reported to the foundation that patients have been able to improve their laboratory results and nutritional well being. Statistical analyses of patient lab results show that the supplied supplements have a direct effect on the way patients feel, dramatically improving their energy level and quality of life. Since the program began, over 9,000 at risk individuals with diabetes, high blood pressure, or a family history of kidney disease have been screened by our Kidney Evaluation Program (KEP). Blood pressures are taken and blood is tested for GFR readings to help those at high risk to see a nephrologist to prevent or delay kidney failure. In our commitment to insure quality healthcare to patients, the Foundation has supplied over 800 pieces of Medical Alert Jewelry. These warning bracelets and necklaces are essential for patients in case of medical emergency. The foundation is dedicated to ensuring that Utah & Idaho Kidney patients receive the latest information regarding medication, treatments, nutrition and information which may improve the quality of their daily lives. Patient conferences are tailored to fit individual patient needs and feature question and answer sessions with physicians and other healthcare professionals, patient support groups, and uplifting motivational speakers to name a few. Check the news and events to find information on the next conference. The National Kidney Foundation of Utah & Idaho supports patients and family members by holding informal support groups. When facing kidney failure, you don’t have to go it alone. Our support groups bring together people facing similar issues, whether that’s questions about dialysis, transplantation or coping with depression and the stress of kidney failure. Members of our support groups share experiences and advice. Support groups are meeting 4 times a year. Information on the next meeting can be found by contacting our office. Our Patient Information Help Line, NKF Cares, offers support for people affected by kidney disease, organ donation or transplantation. It’s designed just for patients, family members and care partners. Speak with a trained specialist who will answer your questions and listen to your concerns. Click here to learn more. Your comprehensive guide to kidney disease and related conditions and topics. Visit the site here. Kidney Living is the National Kidney Foundation’s FREE magazine for dialysis patients! Each issue features stories from people who are living well on dialysis, as well as tips for coping with kidney disease, healthy eating, finding support, and so much more. Learn more here. If you or someone you love is experiencing kidney failure, you may be worried about making ends meet financially while you’re unable to work. Fortunately, the Social Security Administration (SSA) offers disability benefits to people in need. Kidney failure that is advanced will often medically qualify for disability benefits, meaning your family may be eligible for resources to help pay for your treatment and other daily living expenses. The SSA uses its own medical guide as the Blue Book to evaluate claimants and determine whether or not they’re ill enough to receive disability benefits. Kidney failure is found in Section 6.00 of the Blue Book, which covers kidney disease. *Note that this section of the Blue Book is immensely complicated and was written for medical professionals. This article gives just a brief and simplified summary—It’s strongly recommended that you go over the Blue Book with your doctor to determine if you’ll medically qualify. 1. You have chronic kidney disease with dialysis that has lasted, or is expected to last, at least one year. You’ll need at least one acceptable medical source stating your current dialysis treatment plan. 2. You’ve received a kidney transplant. This will automatically qualify for one year after the procedure. If you have not had your transplant surgery but are on the donor waitlist, you will not “automatically” medically qualify, but you will almost certainly meet another kidney disease listing. Estimated glomerular filtration rate (eGFR) of 20 ml/min/1.73m2 or less. 4. Anorexia with weight loss, determined by having a BMI under 18. You’ll need proof that your BMI was calculated on two occasions at least 90 days apart. Again, the kidney failure listing is very complicated and should be reviewed by a medical professional. Because the entire Blue Book is available online, you should be able to do so at your next doctor’s appointment. 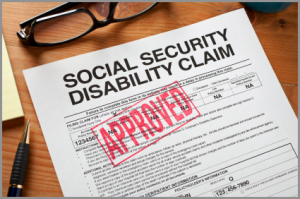 If you think you might qualify for disability benefits, you should apply for Social Security as soon as you can. The average claim takes at least three to five months to process, so the sooner you apply, the sooner you’ll get the financial assistance your family needs. Most claimants can complete the entire application online on the SSA’s website. You will not need to physically submit any paperwork documenting the severity of your kidney failure, but you will need to mark the hospitals where you’ve received treatment so the SSA can gather your medical history on your behalf. Once approved, you can spend your benefits on medical care, transportation, or any other daily needs. This article was written by the Outreach Team at Disability Benefits Help. They provide information about disability benefits and the application process. To learn more, please visit their website at http://www.disability-benefits-help.org/ or by contacting them at help@ssd-help.org. Held in Salt Lake City, the 1996 the U.S. Transplant Games was the largest gathering of transplant recipients in history, hosting 1500 athletes. 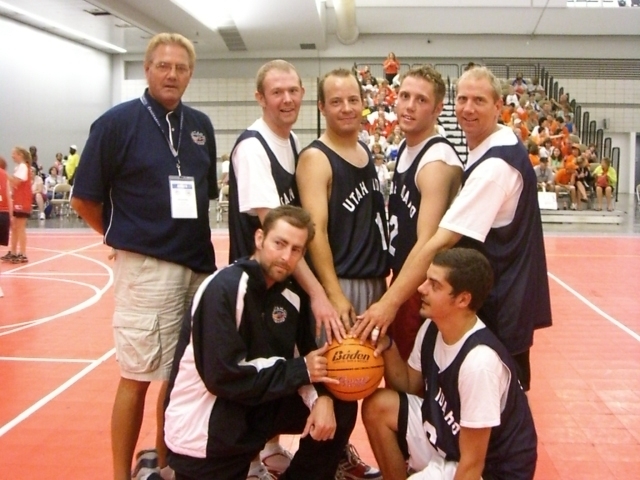 This unique Olympic-style competition was organized by the National Kidney Foundation and the Utah Idaho affiliate. Dental Select of Utah provides over 100 families with the “silver dental program.” This dental discount plan enables patients to receive treatment from over 125 general dentists, endodontists, oral surgeons, and periodontists throughout the state of Utah, and to receive this treatment without insurance premiums, annual benefit limits or pre-existing condition clauses. With Medicare and Me dicaid offering little by way of dental benefits, dental care is often viewed as unaffordable by many patients. Through this dental plan, more dialysis patients are able to receive dental care. Dental health and the control of oral infections are a requirement for consideration of organ transplantation. Please take a moment to browse the and read about the various programs that we have in place. What? KEP is a free health screening program offered by the National Kidney Foundation of Utah & Idaho for individuals with an increased risk of developing kidney disease. Why? The two main causes of kidney disease are diabetes and high blood pressure (almost 75%). Because kidney disease can be ‘silent’ until the very late stages it is advised that those at risk be screened. With added information and testing, you will be better prepared to discuss any risk factors as well as a treatment plan with your doctor that may prolong or prevent the need for dialysis or transplantation. Who? You should attend a KEP screening if you are 18 years or older and have one or more of the following: diabetes, high blood pressure, or a relative with high blood pressure or kidney disease. When? Check our News and Events page for a date and location near you! Tests? The following will be provided to you at the screening: height, weight, blood pressure, and blood tests. Blood tests will target the blood glucose (blood sugar), hemoglobin (test for anemia), serum creatine (blood filtering), and glomerular filtration rate (kidney function). Follow-Up? The National Kidney Foundation will contact you with results. How? To obtain more information on a Kidney Evaluation Program (KEP) in your area, check the calendar of events on this website or call the office of the National Kidney Foundation of Utah & Idaho, 1-800-869-5277 (statewide) or 226-5111 (Utah County). US Department of Health and Human Services awards NKFU&I for outstanding participation in the workplace partnership for life program. 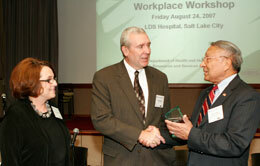 The National Kidney Foundation of Utah & Idaho has been the proud sponsor of the Workplace Partnership for Life (WPFL) program. The educational program, initiated by the U.S. Department of Health and Human Services, calls on corporations, businesses and organizations of all sizes to share information about organ and tissue donation with their employees. Recognizing and understanding the diversities among employees and worksites, WPFL takes a unique approach in helping to save lives by encouraging partners to identify for themselves the specific activities and strategies which they will implement to increase awareness. Tailoring the program to meet the needs of every participating organization is one of the many successes of the partnership. WPFL provides up to date information, clears up myths with facts, and gives employees the opportunity to obtain information needed to make an educated decision about becoming a registered organ and tissue donor. Send a paper, electronic, or voice message promoting donation from the CEO to each employee. Include articles on donation in your company newsletter. Feature stories about employees who are recipients, donors, donor family members or in need of a transplant or a blood transfusion. Add a pro-donation message to employee pay stubs each month of the year. Distribute donor registration forms and educational materials about donation to employees. Link our local donor registry www.yesutah.org to your website’s home page for access to registering online. Sponsor a presentation on donation: invite donors, recipients, donor family members, and transplant professionals to create a one hour program for employees. Run a PSA or include an electronic banner on your in-house e-mail system. Make your own or acquire one from the Coalition on Donation or your local organ procurement organization (contact information is available at www.organdonor.gov ). Sponsor a blood drive, marrow drive, or organ/tissue donor card signing events. Some companies create competitions among departments or field offices. Post information on your bulletin board or in your newsletters about local community blood drives and donation efforts. Implement a leave policy for employees who donate marrow or an organ.